Installation tasks for setting up a three-tier configuration, with the application middle tier residing on AIX/Win2000 and the database tier residing on z/OS. 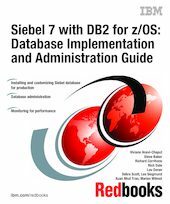 The DB2 Connect EE V7 setup required to connect the Siebel application server to the DB2 database on z/OS is also discussed. Customization of the Siebel schema for a production environment. Migration from a development system to a production system.